Market Courtyard The - Jerusalem Suites is a one of a kind residence offering unique, beautiful, fully furnished vacation apartments for short term and long term stays. Located in the heart of Jerusalem by the Mahane Yehuda Market in the historical neighborhood of Nachlaot, The Market Courtyard offers a special, truly authentic Jerusalem experience. Our central location is 5 minutes from the city center and walking distance to the Old City, right by the Light Rail, and all major public transportation. A beautiful private With courtyard each apartment has a balcony and offers a lovely view. The apartments are fully furnished with modern custom made ​​furniture and have fully equipped kitchens and amenities. Market Courtyard The - Jerusalem Suites offers 5 different types of apartments. Starting with Rooftop Studio apartments for single or double use to Two Bedroom Apartments fit for a family with children. All apartments are fully furnished and have a private balcony. Interested in a tour of Jerusalem? Do you want to take an excursion to Masada and The Dead Sea? Or perhaps the Sea of Galilee? Are you looking for a personally recommended guide? 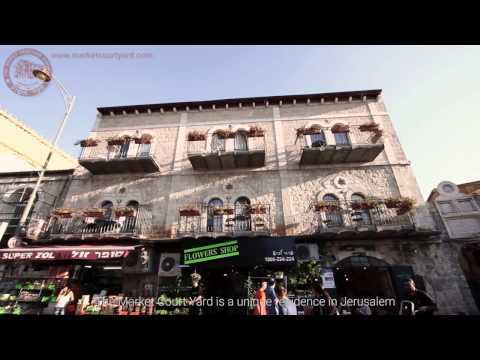 Do you want to really discover the secrets of the spectacular Machne Yehuda Market? Here for information Click about the guides and tours that The Market Courtyard staff handpicked for you to complete your visit in Jerusalem. You can sign up for tours directly from our website!